It is a well-known fact that clustering Magento environments is technically complex. Adding Full Page Caching to a Magento cluster is even more difficult. Many people try to use PHP Full Page Caches with redis backends. This is not difficult, however the performance increase is not very good. Alternatively, introducing Varnish as the cache layer offers better performance. However, this creates a single point of failure, SSL termination issues, cache synchronization issues, and load balancing issues. LiteSpeed Technologies proudly announces the industry’s first single layer, integrated, enterprise scale, application aware Application Delivery Controller (ADC). LiteSpeed ADC simplifies today’s highly dynamic and complex web applications, improving scalability, performance, and security. With built-in LiteMage Cluster, LiteSpeed ADC is the top choice for building a highly available, cache accelerated, PCI compliant clustered hosting stack for large scale Magento stores. Caching in large scale Magento environments is difficult. Whether using Redis in M1 or Varnish in M2, cache consistency and even load distribution can prove to be problematic. In addition, extra layers cause latency for things like SSL termination. LiteSpeed ADC combines the SSL termination, caching, page optimization, and load distribution layers all into a single layer. This greatly reduces the complexity of building an accelerated Magento cluster improving performance and overall cluster efficiency. Magento full page caching has always been very difficult, full page caching for clustered Magento environments make it extremely difficult. Cache consistency across nodes has technical challenges, and has led to single points of failure in Magento stores. LiteSpeed ADC offers Magento customers the first load balanced full page cache, eliminating the cache as a single point of failure. By caching at the load balancer and offering a High Availability setup, LiteSpeed ADC can scale to meet any inbound load. Since it is software-based, it also fits well into today’s devops frameworks. Cache accuracy remains a challenge in Magento. With dynamically built PHP applications like Magento, knowing what pages and components can be cached is a daunting task. Edge Side Includes (ESI) have created ways to dynamically punch holes in pages that were mostly static content but previously uncacheable. LiteMage enabled Magento 1 and Magento 2 stores to be accurately cached. LiteSpeed ADC is LiteMage compatible, bringing enterprise scale customers LiteMage accuracy and simplifies their Magento architecture. LiteMage users typically see 3-5x performance gains versus other full page cache solutions. LiteSpeed ADC introduces layered caching when used with LiteSpeed Web Server. Layered caching allows cache warming for enterprise scale Magento customers without impacting production. Background processes synchronize offline caches once the site has been crawled. This also allows rolling out seasonal promotions without losing cache due to purging outdated pages. 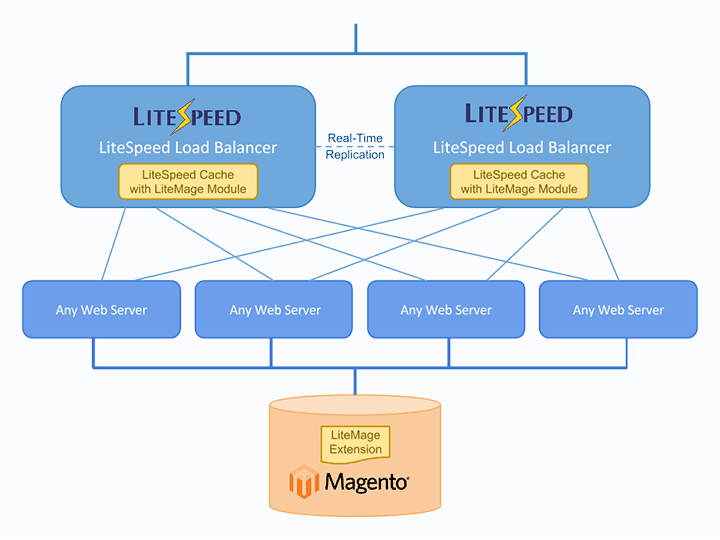 LiteSpeed ADC is the first PageSpeed optimized load balancing cache for Magento. PageSpeed optimizes cache pages without the need for third party extensions before storing them for fastest TTFB and resource efficiency. LiteSpeed ADC represents the first Magento caching load balancer available to Magento customers. It provides an easy full page cache solution for Magento clusters and further improves site performance with Google PageSpeed optimization. By moving the caching layer up to the load balancer, LiteSpeed ADC improves the cache efficiency and consistency, and can be deployed against any existing backend web server technology. LiteSpeed Technologies recognizes that Magento customers rely on their web stores as revenue engines. LiteSpeed ADC is the most technically advanced solution for Magento customers operating in complex environments. LiteSpeed ADC delivers significant performance gains while eliminating risk from single points of failure, driving the highest conversion rate possible for your Magento store.